The blades had to endure 13,000 revolutions per minute and temperatures beyond 1,250 degrees Celsius. Siemens has completed its first full load engine tests for gas turbine blades completely produced using 3D printing technology. Siemens said the components were tested at 13,000 revolutions per minute and temperatures beyond 1,250 degrees Celsius. The company also tested a new blade design with a completely revised and improved internal cooling geometry manufactured using the 3D printing technology. 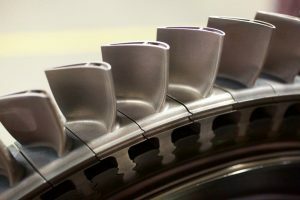 Willi Meixner, CEO of the Siemens Power and Gas Division, said the project team used blades manufactured at its 3D printing facility at Materials Solutions, which were then tested at the Siemens testing facility in the industrial gas turbine factory in Lincoln, UK. 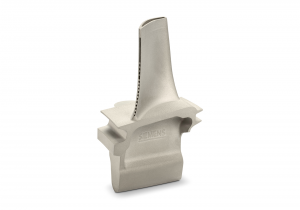 “This is a breakthrough success for the use of Additive Manufacturing in the power generation field, which is one of the most challenging applications for this technology,” Mr Meixner continued. Siemens finished its first full load engine tests for conventional and completely new designed gas turbine blades produced using Additive Manufacturing technology. Siemens said the blades, which are made out of a powder of high performing polycrystalline nickel superalloy, were installed in a Siemens SGT-400 industrial gas turbine with a capacity of 13 megawatts (MW). It said the composition of these blades allowed them to endure high pressure, hot temperatures and the rotational forces of the turbine’s high speed operation. “At full load each of these turbine blades is travelling at over 1,600 km/h, carrying 11 tons or equivalent to a fully loaded London bus, is surrounded by gas at 1,250 °C and cooled by air at over 400 °C,” reads the company’s press release. For Mr Meixner, there is no doubt that 3D printing is rapidly becoming one of the main pillars in the company’s digitalisation strategy. “This exciting technology is changing the way we manufacture by reducing the lead time for prototype development up to 90 percent,” he explained.